The objective of WP7 is to endow the robot with the task planning, monitoring and control abilities that are necessary to share its space and task with a human partner, involving also close physical cooperation as a core element. 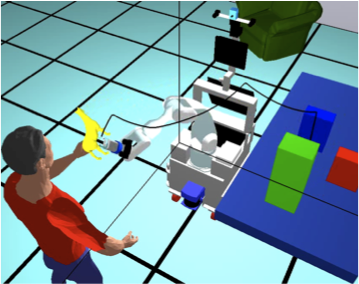 In this context, the robot should not only ensure the feasibility of its part of the joint task but also satisfy safety and legibility requirements of its motions. Therefore, reasoning mechanisms should not only involve task and action management but also include spatial reasoning on the environment, on the humans, on the objects to be manipulated, and on the robot itself. Globally WP7 has to do with so-called higher-level context/task based decision layer for SAPHARI robots.